swim until you can't see land. : those are my shoes, this is my life. this blog is going to be all kinds of stuff about me. potentially. trust me. if you're one of my regular readers (i feel like i don't have those, honestly) then you know a decent amount about me. for those of you who have never read my blog before, well. hi. here we go. my life in descriptive pictures. meet emily, our protagonist. she is a twenty year old education student at a small liberal arts school called alma college with hopes of being a spanish and literature teacher. this is her sophomore year. due to back injuries, she has had to leave her family, the alma college swim and dive team, for a new family: the south campus RA staff. she has recently joined the sorority gamma phi beta and is an active member in active minds, the only group on campus devoted to ending the stigma against mental illness. in her spare time (if it arises) she reads stephen king, blogs, and goes to the park. and of course, watches copious amounts of criminal minds. 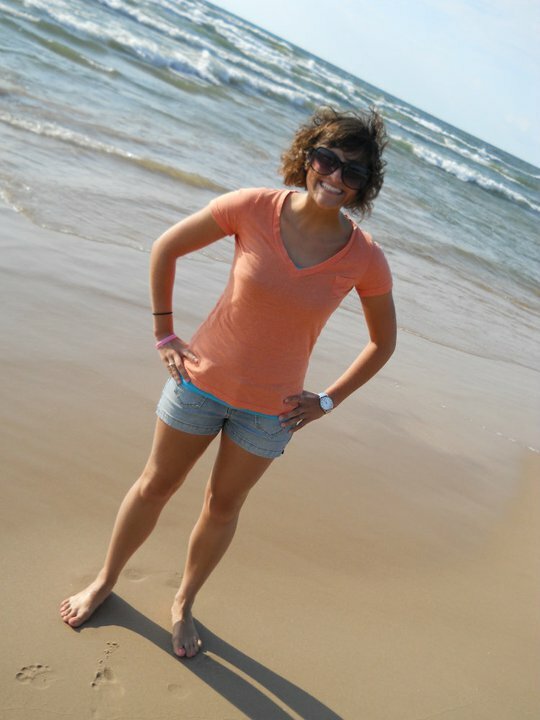 this is me happily standing in what allison would call "the birdy position" on lake michigan. i like this picture, but i do not feel like it is an accurate representation of me for one small reason. i believe that in this picture i look like i'm five foot two. i am, in fact, five foot nine. with big feet. my mother is five foot two. this is my boyfriend. his name is jacob. 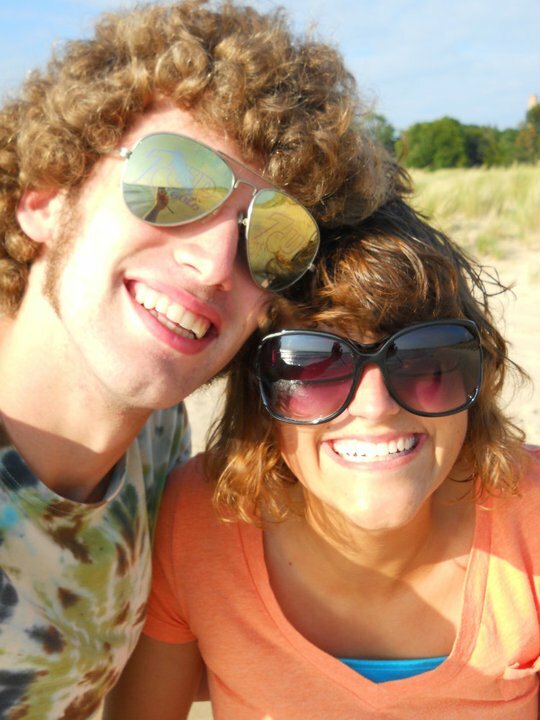 he has an afro. he's six foot four and writes poetry. he makes me happy. he also wears cardigans. this is my refrigerator. i named him voldemort. (one cannot simply name their fridge voldemort, but i can. i can also simply walk into mordor.) he does have two other name tags that have my name on them, but the real name tag, the one in english, that one has voldemort on it. i thought about crossing out the "pleased to meet you" and replacing it with "avada kedavra" but my handwriting just isn't that good and it's already stuck on there for good. voldemort is a hipster fridge. he even has a sticker with the hipster essentials poster on it. he mostly houses muffins and dr. pepper. the top of him says "emerson" and i'm thinking about gettting magnets and putting "ralph waldo" up there. note that my dorm is velociraptor free. remember when i impulsively bought a cello? this is estlin. that's e. e. cummings estlin. he and voldemort hang out a lot. i am a busy person. i am compulsively busy. i have a dry erase calendar, a daily planner, a phone planner, and a monthly planner on my extra desk. i am busy busy busy busy busy and i love every minute of it. if you participated in my june go! challenge, then you know this. feel awesome. miscellaneous things. we all have them. this should not need an explanation. it is fantastic and is over my bed. this is atticus. he is my pet cactus. he is not named after atticus finch. he is friendly. and lastly, this is where the magic happens, the magical blogging. this is kip. he's named after my friend kip, who's an eighteen year old NLP (no light perception) blind kid who solves braille rubik's cubes. i could lead you on and pretend that kip is a real person, but he's really not, he's a book character. but i've never related to a book character more than i've related to him. ever. so i pretend that he's real. i honestly don't think it's weird. this is kip the laptop. it's a crappy picture, but i am a blogger, not a photographer. that handsome boy (um. man. he's thirty-one.) is matthew gray gubler and if you remember correctly, i like him quite a lot. if your vision is good, it's not tricking you. the middle sticky note does indeed say I LIKE VOLDEMORT HUGS. i'm not really sure how to end this. this was an awkward blog. it involved me wandering around my room with my cheap touchscreen camera taking pictures of my stuff. honest to god, i was in the shower about two hours ago and i was standing there running shampoo through my hair and lamenting about my spanish homework when i thought to myself, oh snap, i could write this really neat blog about myself in pictures with captions and people can really get into my life. well. i don't think it worked out too well. it's not what i was dreaming up in the shower, certainly, and i honestly feel like me blogging about other things, like the lion king, harry potter, and my room flooding, gives you a better impression of who i am. i am glad that you read my blogs. that you stick with me. i really am. because i'm still new at this. it's just something that i love to do. post script: if you understand the reference in the title of this blog entry, you are my new best friend and i love you. very much. and it's something I love reading. Oh, ps? Chuck Bartowski. BAM.